There has been so much talk recently about millionaires and billionaires not paying their “fair share” of taxes, I decided to look up exactly how much they end up paying. Tim Carney pointed me to this CBO paper on average effective tax rates for 2007 (published in 2010). This is unfortunately the latest data I can find, but it is useful to me because it gives data that can be extrapolated. If I know the average pre-tax income, the average after-tax income and the number of people the top 5% and the top 1%, I can extract the top 1% from the top 5% and calculate that data for people in the top 1.1%-5%. This means I can update my Not All Money Is Created Equal chart. This is a chart of the effective tax rate, so it includes income, payroll, corporate, and excise taxes. It covers all practical sources of income (see the “technical information” at the bottom, since I’m guessing this will be the first objection raised). I love this chart because I think it summarizes so many important things very easily. 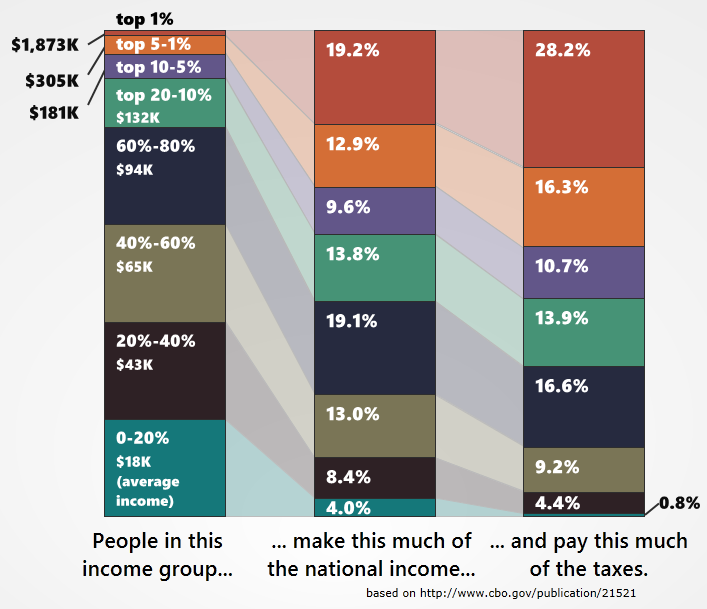 We can immediately get the scope of how much the top 1% makes, (it’s a lot) but also easily see that they pay more as a % of the tax burden than they make as a % of the national income. We can see that the US tax system is actually fairly progressive, with the top 20-10% paying the closest to a “fair share” (if by fair you mean every dollar made is taxed at an equal proportion to all income as a whole). Warren Buffett is an anecdote, but one that has been repeated so often that many people think that the rich, as a whole, don’t pay very much in taxes. This chart shows that this is entirely untrue. When viewed through the lens of effective taxation (which is a very appropriate lens to use) the top 1% of income earners pay a much higher rate on their income than any other income group. Comprehensive household income equals pretax cash income plus income from other sources. Pretax cash income is the sum of wages, salaries, self-employment income, rents, taxable and nontaxable interest, dividends, realized capital gains, cash transfer payments, and retirement benefits plus taxes paid by businesses (corporate income taxes and the employer’s share of Social Security, Medicare, and federal unemployment insurance payroll taxes) and employees’ contributions to 401(k) retirement plans. Other sources of income include all in-kind benefits (Medicare and Medicaid benefits, employer-paid health insurance premiums, food stamps, school lunches and breakfasts, housing assistance, and energy assistance). Individual income taxes are allocated directly to households paying those taxes. Social insurance, or payroll, taxes are allocated to households paying those taxes directly or paying them indirectly through their employers. Corporate income taxes are allocated to households according to their share of capital income. Federal excise taxes are allocated to them according to their consumption of the taxed good or service. I love the smell of wet printer ink in the morning. On one end of the spectrum we have a flat tax. On the other end you have communism, where you have such a strongly progressive tax that we no longer have the rich or the poor. Most people fall somewhere in the middle of this spectrum. Some people make the claim that the poor pay more in taxes than the rich – your graphic above helps to refute that claim. The tough part is figuring out just how progressive we should be. It looks like you have an incomplete sentence right before the Technical Information. Surely you had something profound to say about “the top 1% of income earners.” I’d like to hear it. It is interesting to me that those with a CHI of $132 to $305K per year are the most “fair”. The percentage they contribute is closest to their percent of the income pie. Wonder what that would look like if identified the 0.1% or the 0.05%. Numbers are interesting – the 10-5%’s are doing all right. The point I always make about the “total tax burden” is that it includes payroll taxes which fund individually accrued benefits. It’s the remainder of the tax structure that pays for general government functions. Net out the payroll taxes (or add back to income the value of individually accrued benefits), and the tax structure is far more “progressive” (i.e. redistributive) than your chart suggests, more like this: http://www.taxfoundation.org/news/show/250.html#table6. Which is of course, why “they” are trying so hard to make the payroll taxes more progressive by doing things like applying medicaid tax to transactions above a certain level, means testing social security, eliminating the cap on ss contributions etc. It would be a neat idea to build a little tool that would allow users to slide the right hand bars up and down to achieve what each person thinks is a “fair” ratio and then to compare results. The next step might be to translate those ratios into tax rates to see exactly what marginal and effective tax rates would be implied. The problem would come at the next step. The “theoretical” tax collected from a marginal tax rate would not equal the actual tax collected, because people respond to incentives. Smart people and their smart tax attorneys would plan around high tax rates. Two income families would decide at some point, especially when one earner makes much less than the other, that the take-home pay of the second income isn’t worth it. Employers will lure high end employees with different compensation schemes, paying more in benefits, perks and deferred compensation and less in taxable cash. This complicating factor makes it impossible to adjust the ratios beyond a certain point, and it makes adjusting them an empirical experiment, not a predictable calculation. So the newer info is out there at the IRS SOI section of their website. I do not include payroll tax this debate with the buffet rule is strickly about the income tax at the fedreal level. The payroll tax is being raped as we speak. My beef with the buffet tax is he equates that whole million and up group with all paying captial gains and taxes. This is not true as the IRS data clearly shows. Now that 1 million and up group is around 235,000 people and the average is 24.6 percent (yes thats with the smart tax lawyers). They had 1440 people that paid 0 dropping their average to 24.2% the top 400 earners (the buffets) averaged 17.8 so really the only ones that should be pissed is the rest of that group that is making up the difference to get the average to 24.2. Now in comparasion my group 20-30K averaged 6% . I dont have depenedents or a wife so mine came to 8.9%. Now if you use the people in my group who paid 0 or recieved credits beyond what they paid in my group actually comes to -3.2%. So I dont have a gripe against the wealthy they are paying their share. The ones making the most noise are the ones that arent paying their share. The child tax credits were around billion as was EITC so who really is getting off. Here before you complain tax your total income off your W-2 then tax your federal withheld. Now go to your fed tax form and if you got a return minus that off tax paid (if you paid add it to) now divide that into your total income and see what you really pay first. Start your search here http://www.irs.gov/taxstats/index.html . It irrates me that no one on the media is calling them out no the real averages and letting them associate them with all captial and gains. While I agree that total effective tax rates are the relevant criterion in determining progressivity, the chart you posted is *not* the effective tax rates. It is the tax shares, which is something different. You should have posted the “Average Tax Rates” if you wanted to show effective tax rates, because the effective tax rate is the tax divided by income, not tax divided by total tax. In any case, the data show extremely high progressivity. What’s interesting is that when you compare to the old chart, the tax burden under the current administration has increased not only for the 1%, but also the bottom 60%. The top 40-1% have a lower tax burden. We won’t even get into the fact that you didn’t include regressive taxes like sales, use and property taxes paid to state and local governments. A more telling statistic would be their entire tax burden compared to their wealth – because face it, its not the income of the top 1% that matters to them, or to anyone else. The fact that they own 42% of the entire wealth of this country but only pay 28.2% in federal taxes for the maintenance of that wealth is beyond absurd. Finally, why do you look at tax rates as an end in themselves, and not a means to an end? Why does it matter WHO pays WHAT tax – isn’t the point of this country to have an economy that is as productive as possible so that we are as wealthy as possible, while also being concerned about the distribution of said wealth (so we don’t have people living in squalor just so we can another bill gates)? If this country was better off if we all only paid tax on income over 500k, wouldn’t we all agree that the best policy would then be to tax each one of us on our income only above that level? If we were all better off being taxed on the first 10k and nothing above that, wouldn’t we all agree to do that instead? Arguing about “fairness” in “tax rates” is about the dumbest argument a serious economist could have, unless your argument is that we are worse off because less wealth is created due to said tax rate. And if you start looking at that information, you’ll be quick to see that the top 1%, 5%, etc, aren’t paying enough yet, and the bottom 90% are still shouldering too high of a burden. This thread is an excellent, serious analysis and discussion with the exception of one ignorant poster. I don’t fancy myself an expert on this subject, but I tend to agree with the “wealth maintenance tax”. My understanding is. that national defense is one of the largest line items in the budget, if not the largest. To me, the primary goals of our military are to provide personal safety and protection of our assets against foreign threats. So, yes, if you have the wealth then you should pay to maintain that wealth. No different than me paying for my home security system, the exremely rich should pay to maintain and secure their wealth. I agree with the original poster, expecting to control the assets and have someone else pay to maintain is quite obviously absurd. It’s very nice post. I get a lot information from your artical.Thank you so much for your sharing. You need a better spam filter for the comments.